The election for the 34th Congressional District in Los Angeles on April 4 will be followed by a runoff on June 6. A total of 23 candidates were on the ballot, plus one write-in, to succeed former Rep. Xavier Becerra, a Democrat, who is now California’s attorney general. With such a crowded field, including 19 Democrats, it was expected that no candidate would get more than 50 percent of the vote and the top two would advance to the runoff. 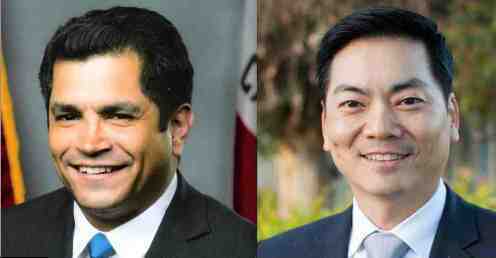 Unofficial results show two Democrats, Assemblymember Jimmy Gomez — who was endorsed by Becerra — and Los Angeles Planning Commissioner Robert Lee Ahn in the lead. In third place was another Democrat, economic development director Maria Cabildo, who was endorsed by The Los Angeles Times. If elected, Ahn would be the only Korean American in Congress and the first since Jay Kim, a Republican from Diamond Bar, served from 1993 to 1999. Also in the running was a Filipino American, Green Party member Kenneth Mejia, who finished seventh. Besides Gomez, the only candidate who has held elective office is Democrat Yolie Flores, a former Los Angeles Unified School District board member, who finished ninth. The district includes Koreatown, Little Tokyo, Chinatown, Downtown, Glassell Park, Westlake, Highland Park, Eagle Rock, City Terrace, Historic Filipinotown, Boyle Heights and Lincoln Heights. As of Thursday, a total of 28,984 votes were distributed as follows, according to the Los Angeles County Registrar-Recorder/County Clerk. The vote total for write-in candidate Michelle Walker, a Democrat, was not immediately available.